There's a lot to see at Pearl Harbor, and this group tour makes it easy to visit the popular sights in a day. 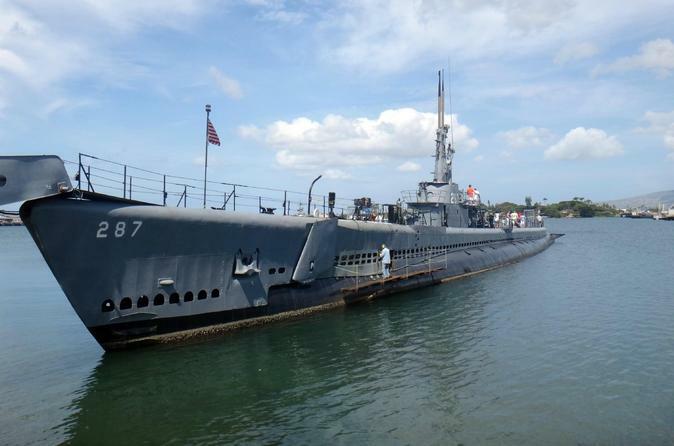 Skip the line at the Arizona Memorial, board the USS 'Bowfin,' and walk the decks of the USS 'Missouri' where the surrender treaty was signed. You'll also visit the Oklahoma Memorial and the USS 'Bowfin' Museum, as well see footage of the Japanese attack that changed the course of history. Cold drinks and transport included from Waikiki hotels. This tour begins at 8am when you're met at the front of your Waikiki hotel in a chauffeured, executive-style van. Depending on your schedule, you can also arrange to be picked up at the Honolulu Airport or cruise port. You'll be offered water or juice upon your arrival in front of Pearl Harbor, and gather with your group to receive an orientation about the sights. Walk through the Pearl Harbor Visitor Center to get some historical background, and when it's time to visit the Arizona Memorial, you'll be able to skip the entire line and board the awaiting boat. You'll also visit the USS Bowfin to tour the inside of a submarine, and follow it up with a headset-guided tour of the submarine museum. When touring the USS Missouri with your group, see the places where kamikaze airplanes left gashes in the hull of the ship, and see the spot aboard the deck where the surrender agreement was signed. This package also includes a visit to the Oklahoma Memorial, where 429 sailors died in the Japanese attack. You'll also have the chance to see footage that was shot on that fateful morning, and on the drive back to your Waikiki hotel, enjoy a short, narrated tour of popular Honolulu sights. After a full day of exploring Pearl Harbor and learning American history, this tour officially comes to an end when you're dropped at your Waikiki hotel.